Shape + Store’s freezer storage containers let you easily create, then freeze, individual portions. Use them with soups, stews, sauces, baby food and more. Simply fill the tray, freeze it, then pop out individual frozen portions as needed. Their Burger Master tray is also great—no surprise—as a burger press. Put ground beef in the bottom, then press the top on. 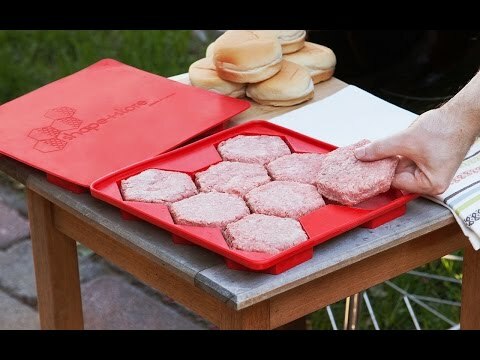 Just like that, eight perfectly shaped patties without having to touch raw meat with your hands. Founders Maya and Greg Liberman initially came up with the design to store single servings of cookie dough. But they realized there are far more foods that people could shape into individual portions, then store for later. In fact, people are coming up with new uses for these freezer storage containers all the time. Shape + Store’s trays are dishwasher safe, and the flat design is easy to store and transport. Save prep time and cook fresh servings whenever the time is right. Hello everyone! I'm proud to introduce Shape + Store to The Grommet. I'd be happy to answer any questions you have! I see the Burger Master, but where might I purchase the other types of items I see in the video? I like the one with dividers between compartments for soup. @Jennifer - Hi Jennifer! 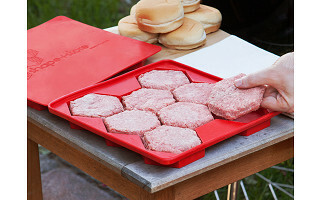 We called it the Burger Master since it's perfect for shaping and storing ground meat, but the Burger Master is so versatile and can be used for all of these types of foods. So if you can use it for soup, stews, sauces, or burgers, it's up to you! @Lisa how much soup can each space hold? 1/2 cup or 3/4 cup? @Anne Hi Anne - each compartment can hold 1/3 cup of soup and/or 4 oz by weight of ground beef. I'd like to know if these are bpa free. Thanks! @r.l. Hi R.L - yes these are BPA and Phthalate free and the material is Made in USA. I like the concept- the price point is a little high for though. @Steve Hi Steve - the price is a reflection of the quality of the product. The material is Made in USA and the Burger Master is manufactured in Canada where we keep a close eye on production. The product is unique and practical. 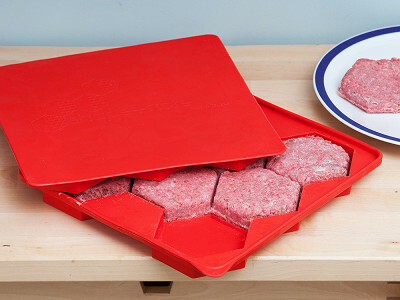 It not only makes 8 burgers (or other food portions at once), it's also a storage container that protects food against freezer burn with a special double seal. I love the idea of a "Shape + Store," are there any discounts for purchasing 2 or more? Hi Gene, not at the moment, but if you get 3 you will receive free shipping! I see this as a very useful addition to my kitchen. I also see this as a nifty holiday gift. However, as someone pointed out, the price point is a bit high - especially if I want to buy several. I am thinking of 9 people who might like this, but that's over $215! Hi Jody, well if you decide to do it, you can rest easy knowing that you're buying a high-quality product with American materials. Those lucky nine people are getting a gift they will use for a long time! This looks great. How many ounces is each compartment? @Michele Hi Michele! Each compartment can hold 4 oz. by weight (1 quarter pound of ground meat) or 1/3 cup by volume (for sauces, soup, etc...). The container holds 2 pounds total. Was wondering about the dimensions of each burger pattie (difficult to judge in pics). Would the typical commercial hamburger bun be utilized or slider size? Great question - and the answer depends on your preference for bun to meat ratio. If you use a regular sized hamburger bun from the grocery store it would fit the pattie perfectly. A slider sized bun would work as well but the pattie would extend past the bun. Thanks for your question! @Maya Would the cookie one work for sliders? I'm in for the hamburger one. Price may seem high but I doubt I'll ever have to replace it. @r.l. Another great question, R.L! The Smart Cookie holds portions approx. 3/4 oz portions by weight. 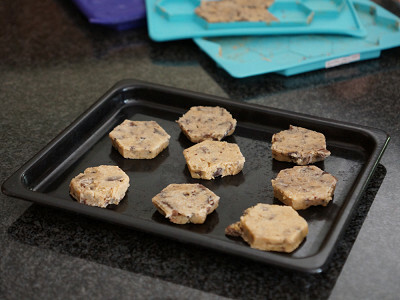 Ideal for cookie dough, since cookie dough expands, they turn into cookies about 3 1/2 inches in diameter (depending on your dough). For sliders, we actually make another product called (you guessed it) Burger Master Sliders that Shapes and Stores ten 2 oz patties by weight. do you plan on offering a large sized compartment,? i would like and 8oz one? i know you can combine two,but for straight up burgers, 8oz is what i would want? @terrence Hi Terrence! We designed the Burger Master to make quarter pounders (4 oz) because we knew this would make a great option for people who wanted a standard sized burger and could still easily put 2 together for a double. The shape is designed to be thick to ensure juiciness. As for different sizes, I think you'll be pleased with our next design! Shape + Store’s freezer storage containers let you easily create, then freeze, individual portions. Use them with soups, stews, sauces, baby food and more. Simply fill the tray, freeze it, then pop out individual frozen portions as needed. 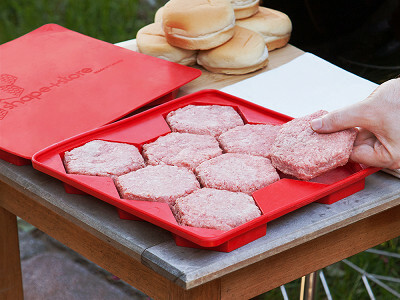 Their Burger Master tray is also great—no surprise—as a burger press. Put ground beef in the bottom, then press the top on. Just like that, eight perfectly shaped patties without having to touch raw meat with your hands. 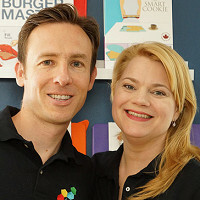 Founders Maya and Greg Liberman initially came up with the design to store single servings of cookie dough. But they realized there are far more foods that people could shape into individual portions, then store for later. In fact, people are coming up with new uses for these freezer storage containers all the time.